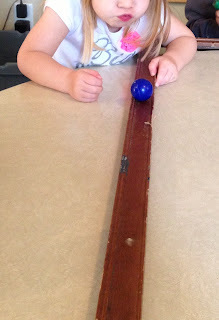 After we found all the things our magnets would stick to, the little girl placed one of the magnetic balls onto the large wooden frame we had on the table. The ball rolled along the frame as if it were on a track. This brought attention from the other children, and four more children joined our group. I placed a magnet in the middle of the frame and rolled the ball towards it. The children seemed very excited by the snapping noise it made and asked for me to do it again. I asked them “What would happen if I moved the magnet to the very end?” “You would have to push it real hard!” said one of the children. 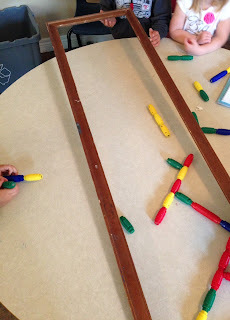 We moved magnets at all different distances and decided how hard we would have to push it in order for it to connect with the other magnet. 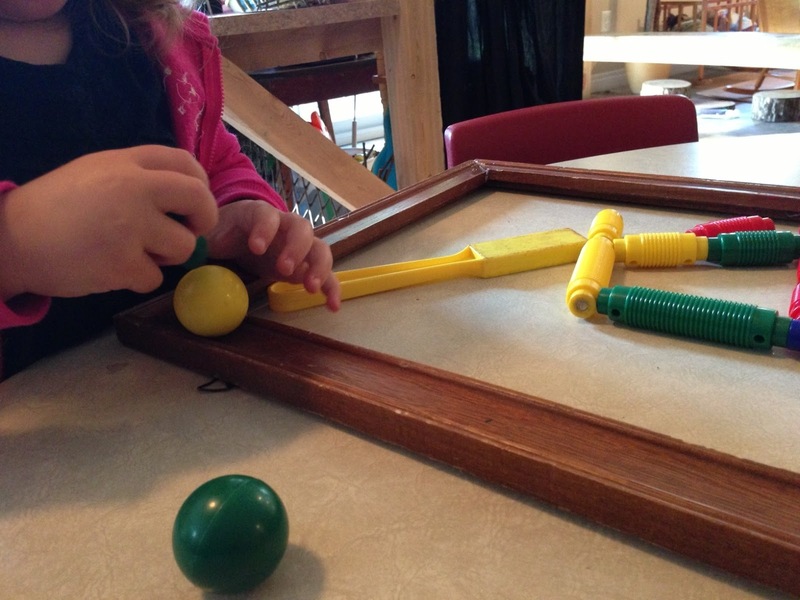 I continued our invitation by asking “How can we roll the ball without touching it?” They thought for a second, took the magnet wand and pushed it down the frame. To challenge them a little further I asked, “How can we roll the ball without touching it with our hands or another magnet?” The children sat longer this time looking around the table for other options. “Hmmm... I don’t know” answered one of the children. I walked over to the end of the frame and blew on the ball making it roll. Everyone began to laugh and immediately tried to do the same. 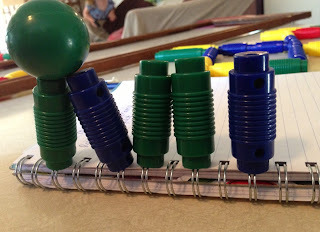 The children worked together to figure out how to move the ball without using their hands or using another magnet. This took communication, team work, and listening skills. 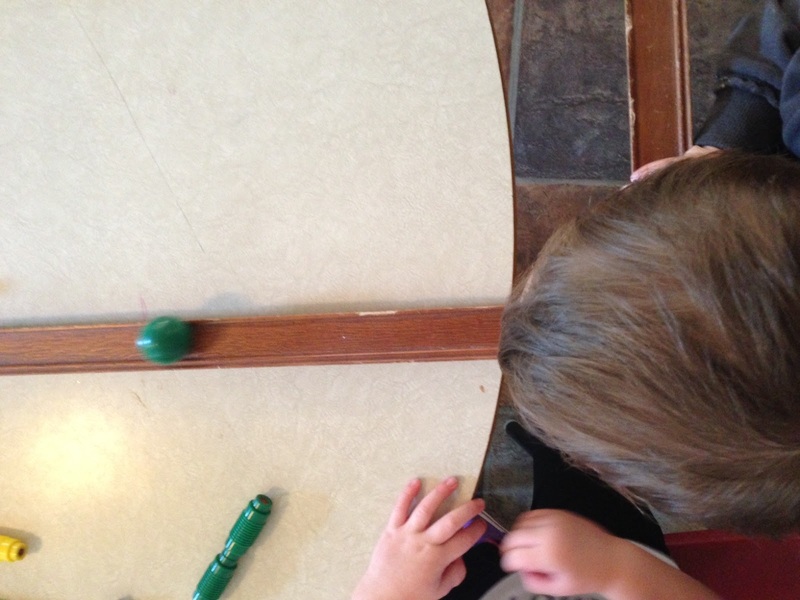 The children learned about science by experimenting with magnets, and measurement was used by determining different speeds and distances. I'd like to extend this invitation by providing the children with different surfaces (such as sandpaper, bubble wrap, water, etc.) and try to see if we can still move the ball without our hands. We could also try experimenting with different strength magnets to see how much weight it could hold and record our results. Do you have any ideas that we could try?